The 4th Annual Farrell Alumni Hall of Fame Awards Banquet was held on October 18, 2008 in the cafeteria of the Farrell Area School District. James A. Raykie Jr., editor of The Herald and chairman of the Alumni Hall board of directors, served as the master of ceremonies. Wally Wachter found that his ability as a journalist not only provided an interesting four-year stay in the Army, but a career at The Herald that spanned more than four decades. He closed out his career at The Herald in 1983. Since then, he has authored a popular column for the newspaper, "The Way We Were," a weekly anecdotal collection of his experiences during his days growing up in Farrell. While in the Army stationed in Hawaii, he was associate editor of the Pacific edition of Stars and Stripes, a newspaper for service personnel. His assignments included a news conference with President Franklin D. Roosevelt and a tour of the Hawaiian Islands with a Bob Hope USO troupe. In addition, he did some ghost writing for baseball star Joe DiMaggio, who was stationed in Hawaii with the Air Force. While at The Herald, he was a longtime member of the board of directors of the Pennsylvania Society of Newspaper Editors and served as president of the United Press International Editors of Pennsylvania. In that role, he helped draft meetings that led to the state's first open meetings and records law. Campman has employed a wealth of experiences from college, the military and the private sector to forge a prominent Mercer County company that develops life safety products. He graduated from Youngstown State University with a degree in engineering and began working for the Navy Department in Silver Spring, Md., in 1964. He returned to the Shenango Valley in 1976 and founded Grace Industries Inc. He has developed products to aid the deaf, the visually handicapped and elderly with alerting systems and developed and manufactured a line of security products. Since 1983, he has focused a great deal of his efforts for the betterment of apparatus for firefighters. The result has been a line of safety products for firefighters that are sold worldwide. He holds more than 50 patents. His company is recognized as the world's only manufacturer of stand-alone NFPA-compliant personal alert safety systems and leader in supplying products for life safety. Terry Komar had an illustrious and decorated 20-year career in the Marine Corps and has been a successful entrepreneur. Before retiring from the Marines in 1978 as a lieutenant colonel, he had amassed numerous honors, awards and achievements. Among them, he was awarded the Bronze Star with Combat "V" for bravery and meritorious service in connection with operations against the enemy in the Republic of Vietnam. He enrolled at Marietta (Ohio) College and joined the Naval Cadet Flight Program in 1955, wanting to become a Marine fighter pilot. But a vision problem blocked that path, and he returned to Marietta, graduating with a bachelor's in business administration. After various assignments as a combat engineer platoon leader in Okinawa to an airborne artillery and close air support observer, he was sent to serve in the Vietnam War as a captain of C Company in Chu Lai in 1966. Pat Buzzeo earned an associate degree in administration of justice from American University while serving with the Washington Metropolitan Police Department, where he was involved in many of the major political events that occurred in the nation's capital. He served at inaugural events for presidents and stood watch at the funeral procession of John F. Kennedy. He was involved in maintaining peace during the 1968 riots and many of the protest marches that took place around the Capitol. He was promoted to sergeant in 1982 and retired in 1986. He became a special agent for the Defense Department until 1997, responsible for conducting the security clearances of the Army Honor Guard at Fort Myers, Va. He was transferred to Andrews Air Force Base and conducted the security clearances for all personnel assigned to Air Force One, Air Force Two, and all other units of the president's air fleet. He was recalled from retirement in 2002 as a private contractor to help in the new security issues brought about by the terrorist bombings of Sept. 11. Domenic Apisa used his expertise in electrical engineering in a career with the National Aeronautics and Space Administration that spanned four decades. He had a hand in every major project at NASA, from the early days of the Apollo program to the space station and shuttle operations. He holds a degree in electrical engineering from Youngstown State University, and from 1963 through 1977 worked for NASA at the Goddard Space Flight Center in Maryland on numerous projects associated with electrical engineering design. He worked at NASA headquarters in Washington from 1978 until 1997; from 1997 until 2000, he worked at the Johnson Space Center in Houston. From 2000 until 2005, he worked for Boeing Aerospace Corp. He received numerous prestigious awards from the Goddard Space Flight Center, Boeing, NASA and the Johnson Space Center. Among them was the Astronaut's Silver Snoopy Award for personal achievement in planning, programming and funding of the construction of the Neutral Buoyancy Lab that astronauts use to train extravehicular activity. Sol Gully co-founded with MIT colleagues a world-class company that provides leading-edge research for agencies and offices of the Department of Defense, the Intelligence Community and the Department of Homeland Security. He co-founded Alphatech in 1979, which was sold four years ago. He remains a consultant for the firm that provides advanced information technologies for solving national security and intelligence problems. He graduated from Youngstown State University with a degree in electrical engineering, studied at Polytechnic University and Massachusetts Institute of Technology, earned master's degrees in both electrical engineering and system science and a Ph.D. in system engineering. He joined GE Ordnance Systems, where he worked on the Poseidon and Trident missile projects. He worked with many defense projects at the national and international levels, including ones during the Cold War and war on terrorism. Fred DeGerolamo Jerome fulfilled a lifelong dream of a career in the field of chemistry and founded a major diagnostics company in 1978 with a worldwide reputation. His company, Monobind, is in Lake Forest, Calif., and is a provider of assays and biological raw materials to market-leading distributors, laboratories and manufacturers in the field of biotechnology. It's Monbind's vision to enhance worldwide health care by supplying laboratory diagnostic tools that are innovative, simple to use and cost-effective, and to work hand in hand with the Centers for Disease Control. He earned a bachelor's degree from Youngstown State University and from 1967 until 1971 was a graduate student at the University of Southern California, where he earned a Ph.D. in chemistry. He is a patentee for the diagnostic reagent system that is produced and sold for global distribution in more than 60 countries. He has developed an assay for validation and FDA submission for a new lung cancer therapy drug. Knezevich spent a quarter of a century working for the Urban Redevelopment Authority in Pittsburgh, leading many high-profile projects such as Nine Mile Run and South Side Works. He retired from the URA in June and entered a second profession as a registered radiographer with the University of Pittsburgh Medical Center. He graduated from the University of Pittsburgh in 1974 where he majored in political science. He spent the next six years attending law school, traveling through Europe, driving a taxi cab, and working in United States Steel's historic Homestead Works as a bricklayer apprentice. He left the steel mill in 1979 and earned a master's in urban and regional planning from Pitt's Graduate School of Public and International Affairs. He is involved in the Western Pennsylvania Coalition for Single Payer Health Care, which advocates universal health care, and other community endeavors. Alfonso Mazyck attained the rank of major before retiring from the Army in 2001 after a stellar academic and athletic career at the United States Military Academy. In his four years at West Point, he was a three-year letterman in football, a four-year letterman in volleyball and earned a Parachutist Badge before graduating in 1981 and being commissioned as a second lieutenant. He was promoted to captain in 1985. He attended and graduated from the Defense Language Institute in Monterey, Calif., as a German linguist, and until April 1992, he was assigned to the 42nd Army Artillery Group in Germany. He was promoted to major in 1991, and he earned a master's in science of management from Troy State University. He retired from the Army in July 2001. Among his awards are the NATO Medal, three Meritorious Service Medals, and four Army Commendation Awards. Daryl Winston is a prominent Philadelphia lawyer who has compiled an impressive list of legal accomplishments since his admission to the Pennsylvania and New Jersey Bars in 1992. He is unbeaten in the United States District Courts for the Eastern District and Middle Districts of Pennsylvania. He graduated from Penn State University in 1988, earning a bachelor's in the administration of justice. He earned a law degree in 1991 from Ohio State University and an LL.M in trial advocacy with honors from Temple University's Beasley School of Law in 2005. He has been affiliated with Robert J. Casey Jr. & Associates in Philadelphia; McDonnell & Associates in Philadelphia and Mount Laurel, N.J.; Schubert Bellwoar in Philadelphia and Haddonfield, N.J.; and Conrad O'Brien Gellman & Rohn, PC, Philadelphia. Last June, he joined Ross Feller Casey, a firm highly recognized for its work in the field of personal injury. He was the first African-American lawyer hired at each of his last four employers. Edward J. McCluskey, former Farrell High basketball coach and teacher of American history, died in 1987. It's been more than 30 years since he coached a basketball game at the Farrell High gym named in his honor, but his name is still synonymous with both the school and the city. His teams won state championships in 1952, 1954, 1956, 1959, 1960, 1969 and 1972. In 29 years at Farrell, he finished with 574 wins and 153 losses. He was named the National High School Coach of the Year by the National Coaches Association, and in January 2000, was named one of Western Pennsylvania's Top 100 Sports Figures of the 20th Century by the Pittsburgh Post-Gazette, joining an elite list of area college and professional celebrities. He was posthumously inducted into WPIAL Hall of Fame last June. I don't need cooler temperatures, turning leaves or Friday night football games to remind me that it's fall and that winter (gulp) is right around the corner. I know it's fall because I'm at my computer getting ready for two halls of fame in which I take a great deal of pride - the Farrell High School Alumni Hall of Fame and the Mercer County Sports Hall of Fame. I'm chairman of the Farrell group and treasurer of the Mercer County organization. I direct a lot of my energy into both because I believe that such halls of fame are great ways to honor deserving individual achievement in a public and lasting way. I have been a member of the county hall since 1983. I have enjoyed watching the group grow in stature as well as increase its generous contributions to the community. That banquet is scheduled for Jan. 24 at the Radisson Hotel of Sharon and will no doubt attract another sellout crowd of more than 400. While other halls of fame sadly have fallen by the wayside, such as the one in neighboring Lawrence County, ours in Mercer County, established more than 60 years ago, continues to prosper and maintain its status as the oldest local hall of fame in the world. The Farrell Hall is a baby when compared to the county sports organization. It was established only four years ago and is the brainchild of Ted Pedas, former planetarium director at Youngstown State University and a huge school district benefactor and philanthropist. It was Ted's seed money that enabled the hall to get started, and by design, its annual induction ceremony is held in the cafeteria at Farrell High. This year's dinner is scheduled for Oct. 18 and like in previous years offers an impressive list of honorees. Unlike the Mercer County Hall of Fame, the Farrell Hall honors professional and community achievements of its alumni. While graduates who excelled in sports can be inducted, it's not a sports hall of fame. 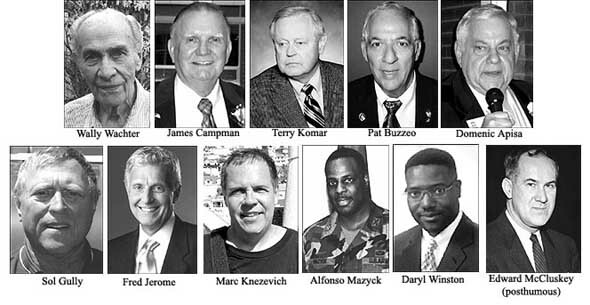 The inductees for 2008 are Pat Buzzeo, Alphonso Mazyck, James Campman, Dr. Sol Gully, Dr. Fred (DeGerolamo) Jerome, Wally Wachter, Marc Knezevich, Dom Apisa, retired Lt. Col. Terry Komar and Daryl Winston. The posthumous inductee is former Farrell educator and coach, Edward J. McCluskey. I have had the privilege to be the master of ceremonies for the banquet since its inception, and I have been amazed at the achievements of the honorees. Most of them live away from the area, and without such a hall of fame to recognize their contributions to their professions and communities, much of it would go unnoticed. I'll be especially glad to reminisce with Marc, with whom I graduated in 1970. He spent 26 years with the Urban Redevelopment Authority of Pittsburgh, where among other things, he served as manager of the Nine Mile Run and South Side Works projects. He retired from the URA in July and began a second professional career at the UPMC School of Medical Imaging, training as a registered radiographer. And of course, there's Wally, with whom I worked at The Herald for 10 years before he retired, and continued to keep in contact with throughout the years. His weekly column, "The Way We Were," has been a staple in The Herald for 25 years. Successful halls of fame, fueled by the dedication of individuals in the community who serve on their boards, are one of the best ways that I know to mark achievements in a sincere and memorable way. That's not my opinion, but an observation from inductees throughout the years. Such halls of fame are capable of providing an experience that honorees won't forget, despite all of the accomplishments in their lives. The ceremonies provide a chance to return home, where everything started, and be honored in front of family and friends. Area school districts that don't have such an organization should establish one. A hall of fame not only honors the past, but offers an opportunity to affect present and future generations as well by highlighting local examples of success and achievement.